Did you know that much of the full body plate armour that we think of as being medieval is usually not medieval at all? Yet the majority of examples of armour shown here are in fact from the Renaissance, or the late fifteenth and early sixteenth centuries, which is when plate armour reached its zenith in Europe. In fact, during much the medieval period men did not really wear the full body suits of plated armour that the general public have come to associate with the “Knight in Shining Armour” stereotype from film and television. Kunz Lochner, Armour of Gustav I of Sweden, c. 1540. Stockholm: Livrustkammaren. As Tobias Capwell, curator of the Wallace collection, has mentioned, “in the fourteenth century they couldn’t make [the] big pieces of iron and steel” that characterise the suits of armour in the google search image above. Rather, they found other ways of protecting the body: chain mail or padded textiles, such as the jupon of the Black Prince. Jupon of the Black Prince (Edward Plantagenet), c. 1370s. Cantebury: Cantebury Cathedral. Now you could spend years debating when the medieval period ends and the Renaissance / early modern starts. For example, historians of England would argue that the medieval period ended in England after the War of the Roses in 1485, while historians of Spain would say it did end there around 1510 with the deaths of Isabella of Castile or later, Ferdinand. The Renaissance is generally categorised as lasting between the fourteenth and sixteenth centuries, although Renaissance is quite a regional term that most often applied to Italian city states. Generally though, it is agreed that the early modern period, which is a little broader in scope than Renaissance, started in 1500 and ended in 1800. Hofjagd- und Rüstkammer, A 62. For the sake of this post though, it is my opinion that the majority of plate armour in the popular imagination of the general public is more characteristic of the later Renaissance period, than of the medieval (although I could be wrong, tell me what you think below!). Armour design and armourers thrived in the first half of the sixteenth century. This was due to one central conflict that raged throughout Europe during the first sixty years of that century: the Habsburg-Valois Wars, also better known as the Italian Wars (1494 – 1559). These were a series of conflicts between the rival French Valois dynasty and the Spanish-Austrian Habsburg dynasty, primarily fought over territory in the Italian Peninsula. Although many of the battles were fought in what is now Italy, the rivalry involved much of Western Europe at the time, and drew in nations such as England, Scotland, as well as the German and Swiss Provinces. The fact that this conflict lasted decades meant that practical armour was not just required, but the rivalry between Renaissance monarchs such as the Holy Roman Emperor Charles V and the French King Francis I required magnificent ceremonial armour that displayed their military prowess, wealth and importance. Dirck Volckertsz Coornhert and Cornelis Bos after Maarten van Heemskerck, The Capture of Francis I by the forces of Charles V during the Battle of Pavia in 1525, c. 1555-56. Amsterdam: Rijksmuseum, RP-P-BI-6603. In fact some of the most famous plate armourers in history were Renaissance artisans who were patronised by key figures of the Italian Wars. As Silvio Leydi has explained, from “the French invasion of 1499 to the peace with France in 1559” Milan was “at the centre of every war between the Habsburgs and the Valois”, and it was successively occupied by various forces throughout the conflict. This involvement with the conflict was capitalised on by Milanese artisans and talented family workshops, such as that of the Negroli family, was established, the most famous of who were Filippo and Giovan Paolo. The Negroli family boasted customers such as Emperor Charles V, King Francis I, Henry II of France, and Francesco Maria I Della Rovere, Duke of Urbino. We know this because much of the armour they created bears their makers mark and has survived in royal armoury collections. Talented armourers also arose in Habsburg territories such as the Seusenhofer brothers, Hans and Konrad, from Innsbruck in Austria. In fact, their workshop was the court workshop of Holy Roman Emperor Maximilian I of Austria, and the Emperor regularly commissioned armour for both himself and as gifts for others. Many iconic pieces by the Seusenhofer brothers, and Han’s son Jorg Seusenhofer, appear in various armour collections across Europe such as those of Maximilian I, Charles V, Henry VIII England and Francis I. As part of my postdoctoral work on fashion during the Italian Wars I travelled to Austria, Spain and France to view a lot of Renaissance armour. Although this is somewhat out of my usual expertise (although there are many parallels you could draw between armour and fashion during the sixteenth century), I found this learning experience helpful to understanding the connections between armour and fashion, as well to key aspects of Renaissance thought such as their conceptualisation of classical antiquity. This was also when my idea of a medieval knight and shining armour was challenged. Stay tuned for my next post where I’ll outline some of the main styles of Renaissance armour that were prevalent during and advanced by the events of the Italian Wars. Silvio Leydi, ‘Milan and the Arms Industry in the Sixteenth Century’, in Stuart W. Pyhrr and José-A. Godoy, Heroic Armor of the Italian Renaissance: Filippo Negroli and his Contemporaries (New York: The Metropolitan Museum of Art, distributed by Harry N. Abrams, Inc., 1998), p. 25. What should we call the torso-shaping female foundation garments of the seventeenth century? Were they pairs of bodies? Bodices? Stays? Moreover, how were they worn? Were they underwear or were the outerwear? This question inspired me to make this post to clear the air, not just about terminology, but also in an attempt to answer this question as it is much more complicated than it seems! 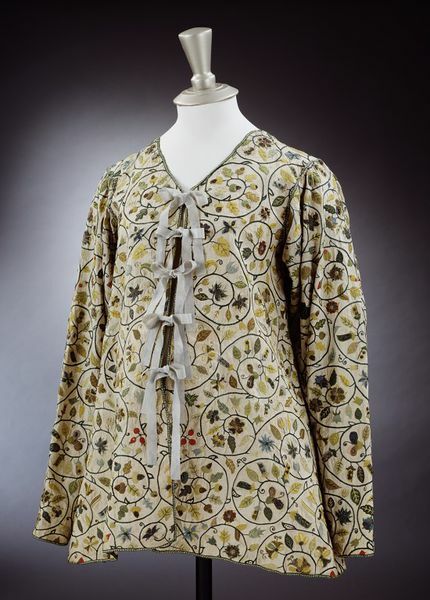 As any long term followers of my blog and my research my have surmised, I rarely use the term “stays” when I talk about sixteenth and seventeenth-century foundation garments, even though museums and other publications almost always do. Randle Holme’s famous 1688 manual most famously makes the distinction between “smooth covered stays” and “stitched stays”, something which Jenny Tiramani emphasises in the new Patterns of Fashion 5: The content, cut, construction and context of bodies, stays, hoops and rumps c.1595-1795. Why then do I not use the term stays when so many others do? Well, in my almost six years of archival research I have never seen the term “stays” used in historical documents to refer to these garments until at least the 1680s. Therefore, “stayes and stiffenings” refers to the materials used to stiffen these garments like whalebone, not to the actual garment itself. Additionally, “stays” referring to stiffening does not just appear in women’s clothing bills. I have also found references to “stay and buckram” in tailoring bills for menswear, such as a suit and coat from 1680 on this occasion. This is why in my own research I use the terminology “bodies” or “pair of bodies” when I refer to these garments that would later come to be called stays and corsets. For me it is important to use the terminology that was used at the time, otherwise we are placing slightly anachronistic modern assumptions onto this clothing. This becomes especially important when it comes to answering the next question of this blog entry regarding the ambiguity of bodies as under or outer wear in the seventeenth century. As you can probably tell the early modern term “bodies” sounds an awful lot like the modern term “bodice”, and that is because the term bodice is derived from bodies! Anybody that has read early modern English sources before knows that was little to no standardised spelling at the time, and so words were regularly spelled different ways (even when they were only sentences apart). Thus, these are terms that are regularly conflated and used interchangeably in the archival sources from this century, there appears to be no rhyme or reason for most of the century as to what a “bodie” is vs a “bodice”, or whether one is an under garment or an outer garment. In the seventeenth century there was not as firm of a distinction between under and outer wear as we see in later centuries when it came to bodies, or other items of women’s dress like petticoats. So “bodies” could be either outerwear or underwear, it all depended on a woman’s social status, the occasion she was dressing for, or maybe her own personal taste. Some surviving bodies from this century contain detachable sleeves (that are laced on with points), indicating that the uses of this garment were flexible, and its use could be easily manipulated depending on the situation it was worn in. For example, for a formal event these pink bodies from the Victoria and Albert Museum may have been worn with sleeves and a skirt, but on other occasions the sleeves may have been taken off and the bodies worn underneath what we would now call a jacket (but at the time was known as a waistcoat). The use of detachable sleeves was probably borrowed from their use in sixteenth-century petticoats (which consisted of a skirt that was attached to a bodice, ie. “petticoat bodies”). For example, in the Dutch genre painting by Pieter de Hooch below, the woman standing in centre wears a waistcoat possibly over a pair of bodies, the woman sitting in front left wears a boned bodice and skirt, and finally the household servant in the background wears what appears to be a petticoat that contains a pair of attached yellow petticoat-bodies over her smock. The particular decade of the seventeenth century being investigated is also important. 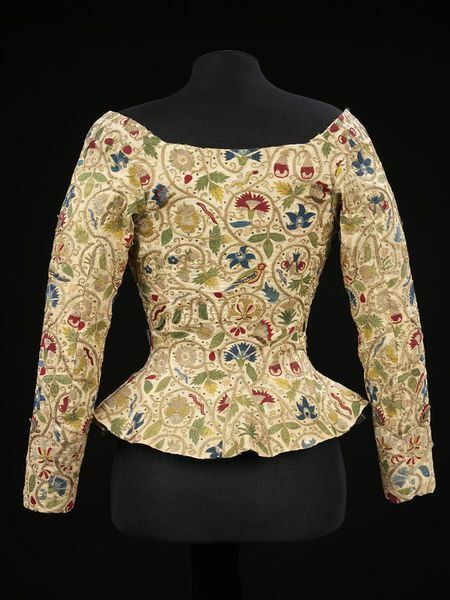 For example, the 1660s saw the rise of the very rigid bodices that were retained for court wear in countries like France well into the eighteenth centuries. The highly boned nature of this garment meant that separately boned bodies were not needed or worn underneath. However, I would be hesitant to claim that this means that under-bodies were discarded during these centuries – as this highly boned style was not universally worn, nor would it have been worn all the time, even by elite women. Overall, there doesn’t seem to have been any hard or fast rules for how to wear bodies during the seventeenth century, and there definitely was not the major distinction between underwear and outerwear like there is in regards to stays later in the eighteenth century. However, there is still a lot to uncover, and I hope to tackle this question in my book that I am currently working on, so who knows, maybe soon I will have a better answer! Man shearing a sheep, early sixteenth century. The British Library, Egerton 1147, f. 11v. Wool was a commonly used natural material in early modern Europe. Besides being spun for use in cloth production and knitted garments (such as men’s felted flat caps), wool was also commonly used in structural garments as stuffing. 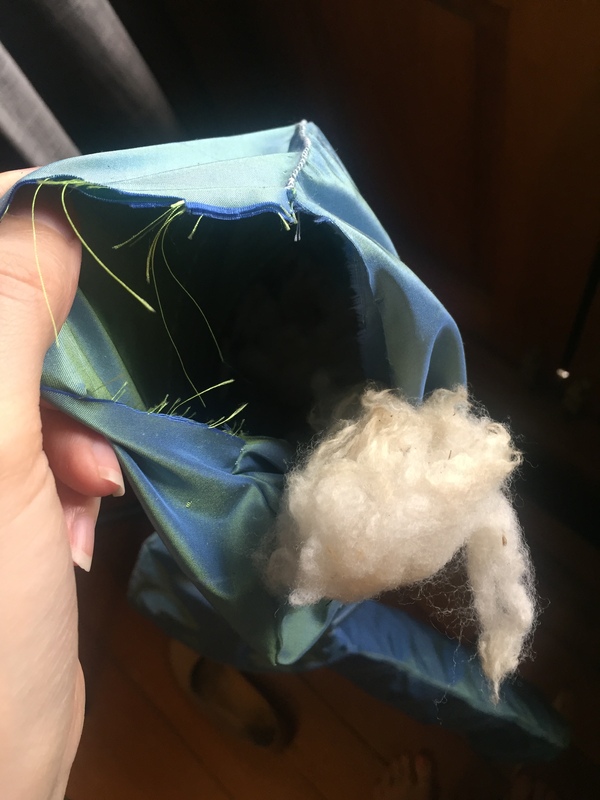 My construction of a French farthingale roll and French wheel farthingale, made as part of my PhD research, required the use of wool as stuffing. Like most early modern sources, terminology often becomes an issue when trying to decipher what materials were used and how. For example, in this wardrobe warrant it is not 100% obvious as to what “cotton wool” refers to. The fibre cotton as we know it was not unheard of in the sixteenth century, but it also was not very commonly used in garment production (although elite women like Elizabeth I would certainly have had access to this raw material from the Indian subcontinent). Further compounding this uncertainty is that ‘cotton’ often referred to a type of woollen cloth in the sixteenth century. 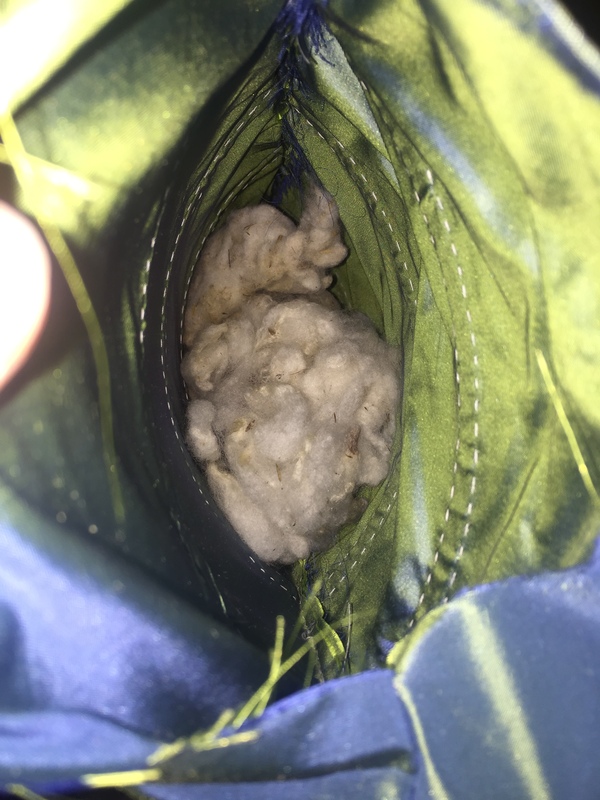 Although these entries might certainly refer to raw cotton, it was probably more common for structured garments in England to be stuffed with wool, a natural fibre that was very readily available and a staple of English industry. As a result I chose to use wool instead of cotton to stuff the rolls of my French farthingale reconstructions. Not only did I choose to use wool due to its ready availability in early modern England, but it was also easy for me to obtain because I was raised on a sheep farm in rural New South Wales, Australia. 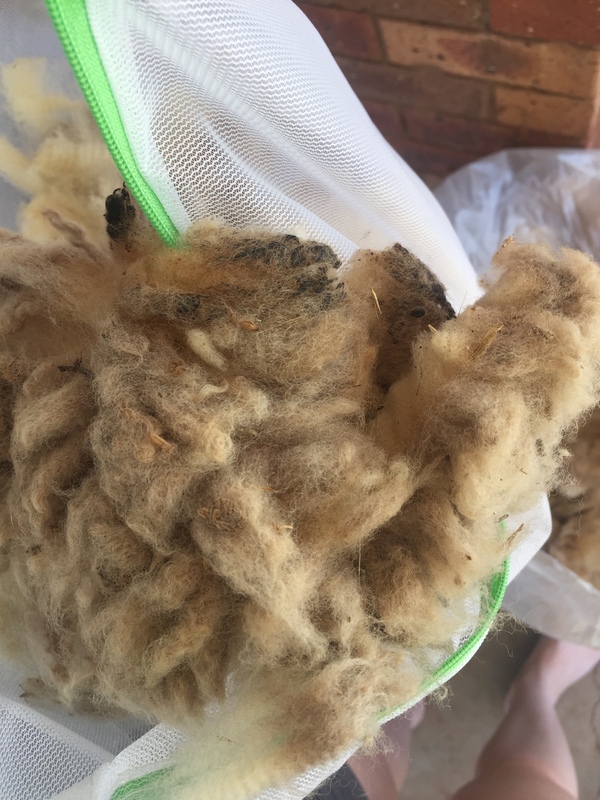 So I asked my dad to put some wool aside for me next time he was shearing. 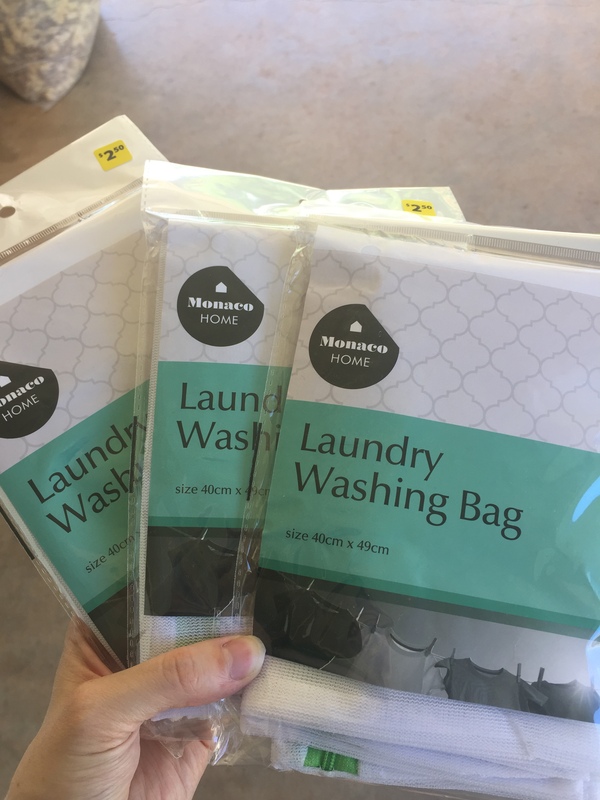 One of the downsides of using this raw material though, especially when it comes from rural Australia, is that it contains a quite a lot of dirt and organic matter. So in order to use it for my reconstructions I had to wash and prepare it. However, as anyone who has ever worked with wool can attest, it is a temperamental fibre to wash. 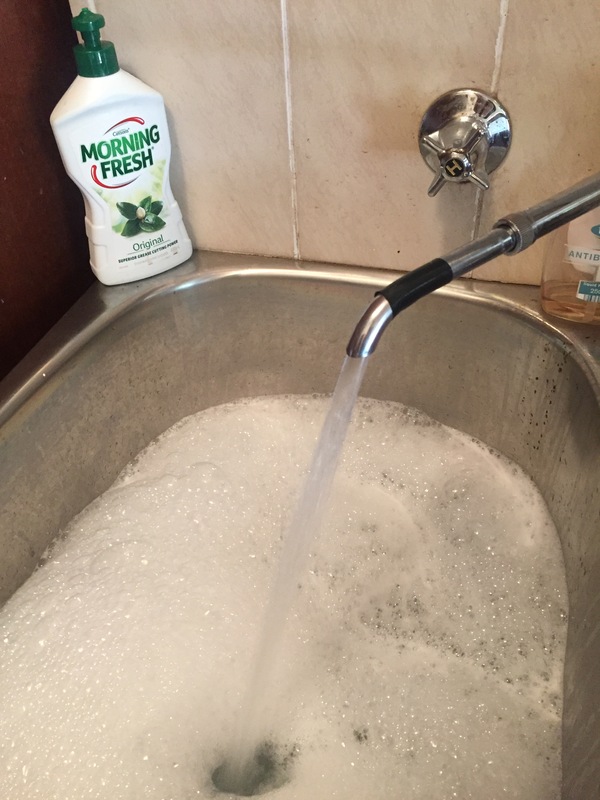 The first difficulty is that if wool is agitated too much in water it has a tendency to felt; great if that is your intention, but a pain if you just want to wash it. Secondly, wool fibres shrink at the high temperatures required to wash it correctly, so I ended up having to use twice as much wool as I thought I would need to allow for this shrinkage. 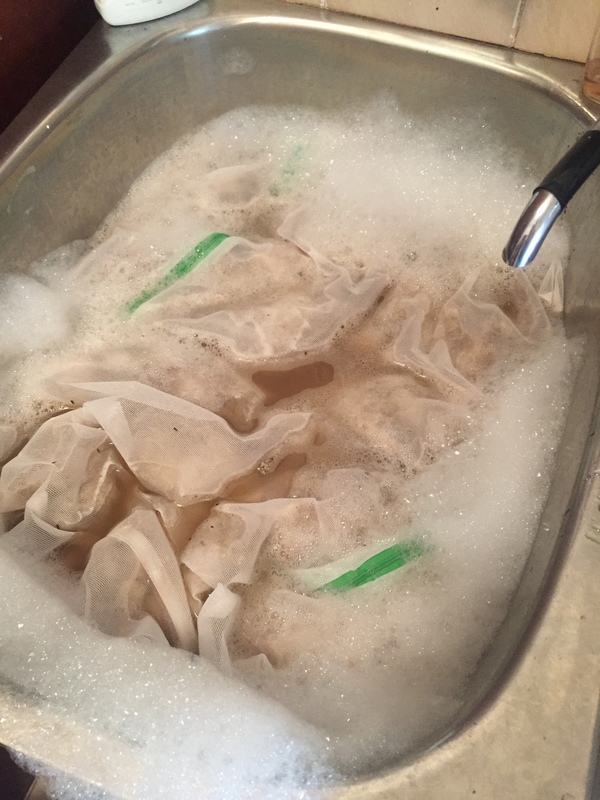 After chatting to other costumers I decided that the best way to wash and prepare my wool would be to buy some large laundry wash bags, stuff them with the wool and allow them to soak in a tub of hot soapy water (oil removing dish-washing liquid seems to be the best option here). While these bags were soaking in the hot water I slightly agitated them every now and then, but not too much in case the wool felted together. As you can see from the pictures the wool did shrink after being immersed in the hot water and A LOT of dirt came out. 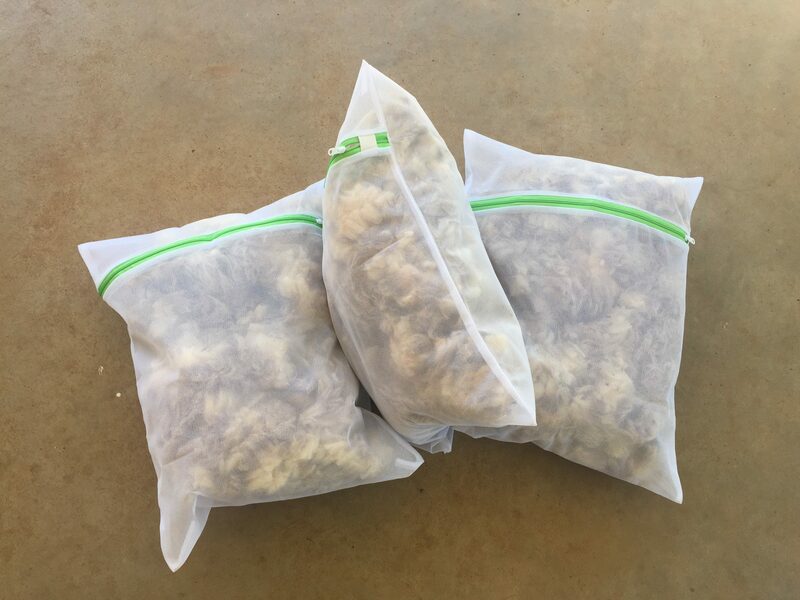 In fact, I had to repeat this soaking process about three times for each bag of wool in order to get it to a satisfactory state. After getting the wool as clean as I possibly could, I laid it out on pavement in the hot summer sun to dry. 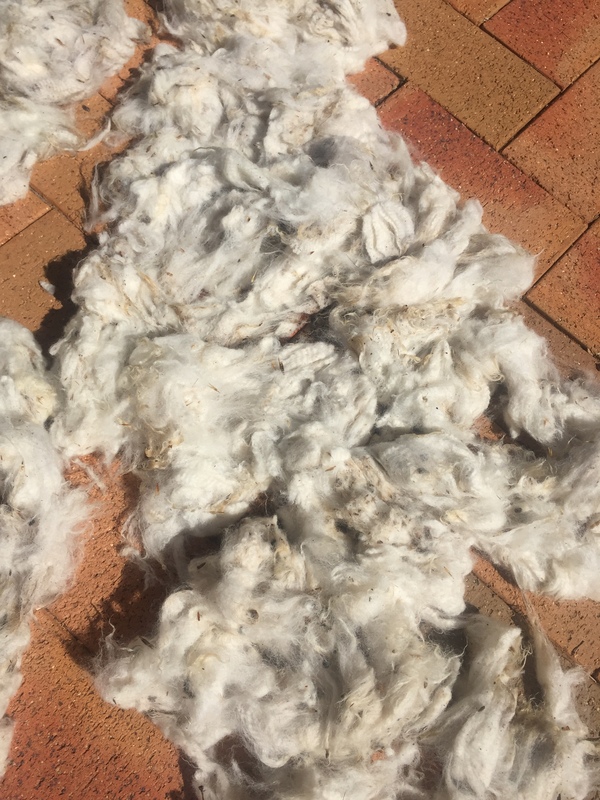 As you can see in the image above, the wool was still full of burrs and other organic plant matter. I did my best to pick out as much of this as possible, but I’m certain that some of it is sitting in my reconstructions, which is fine. 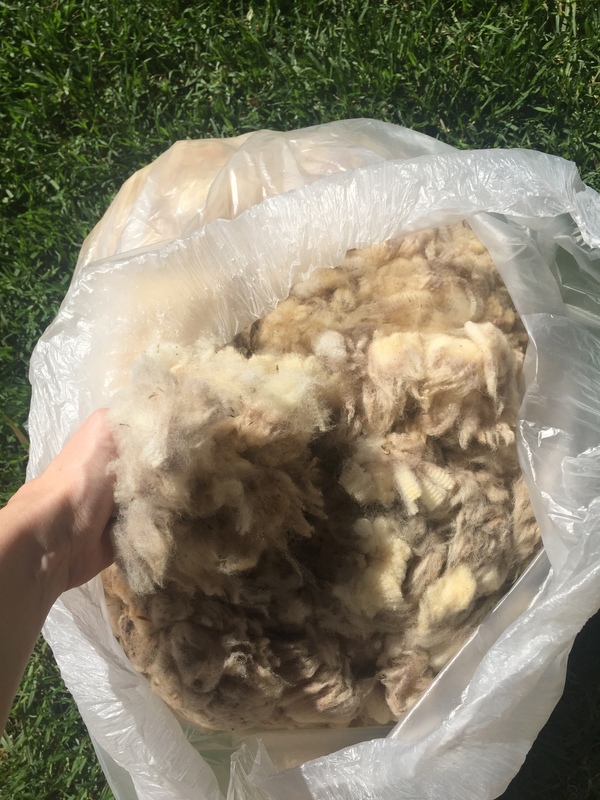 I hope this post has been helpful to anyone thinking of preparing their own raw wool for spinning or stuffing. If you have any tips or tricks that you use to prepare your wool, feel free to comment below and let us know! Wardrobe Warrant of Elizabeth I, 6 April 1581. The British Library, Egerton MS 2806, fol. 166r. Ninya Mikhaila and Jane Malcolm-Davies, The Tudor Tailor: Reconstructing sixteenth-century dress (London: Batsford, 2006), p. 36. William Larkin, Portrait of Grey Brydges, 5th Baron Chandos, of Sudeley Castle, Gloucestershire, c. 1615, Yale Center for British Art. The structural fashions of the early modern period in Europe reached a peak at the turn of the seventeenth century. Women wore farthingales, whaleboned bodies and wired sleeves, whilst men donned puffy hose and peascod-bellied doublets. Whilst the ruff, a gathered and starched linen frill that was worn around the neck, was still widely worn, at the beginning of the seventeenth century a new type of standing linen collar became fashionable. Like the ruff before them, these accessories forced the wearers, both male and female, to keep their head held high as they slightly impeded normal neck and head movement. 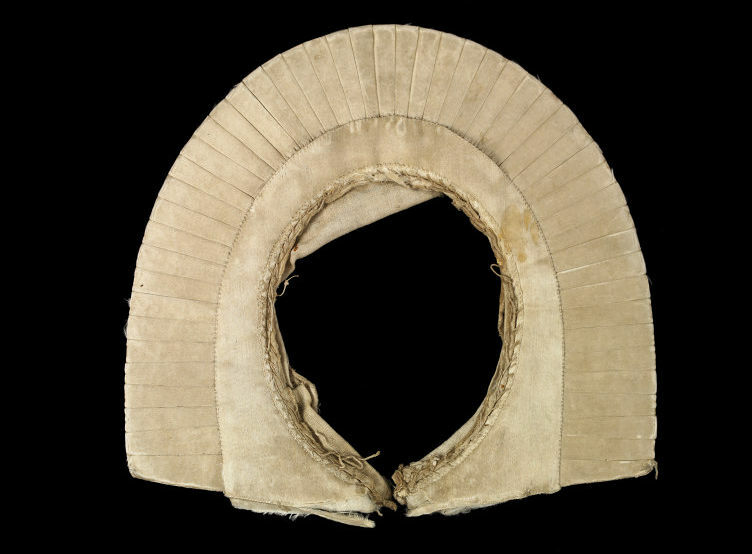 These standing collars also halo-ed the head with bright white, sometimes translucent, linen or silk that was often trimmed with expensive bobbin lace. 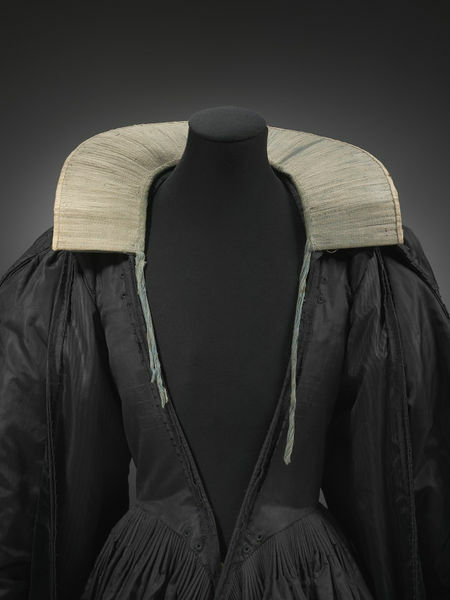 As a result, early modern neck wear such as ruffs and standing collars projected aristocratic ideas of wealth, power and prestige. 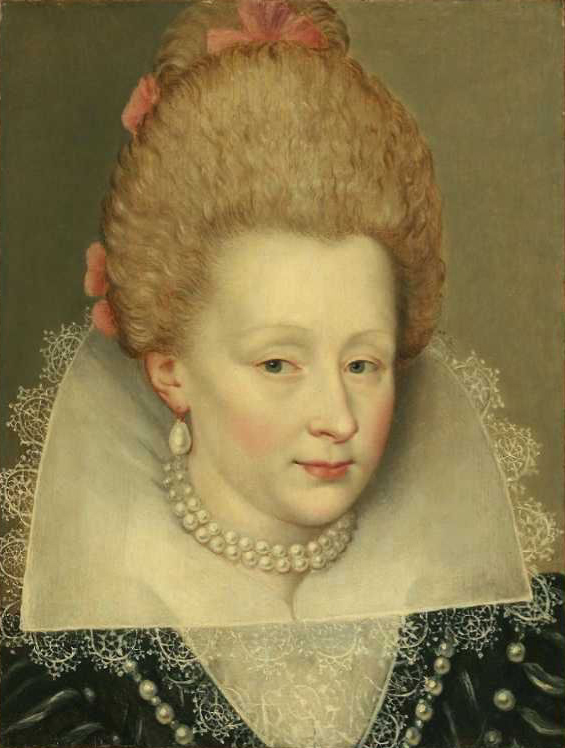 The rebato, also known as a piccadill and underproper (in England) and a suportasse (in France) was a stiffened support for a standing ruff or collar. These accessories were often made from wire or pasteboard that was covered in silk. 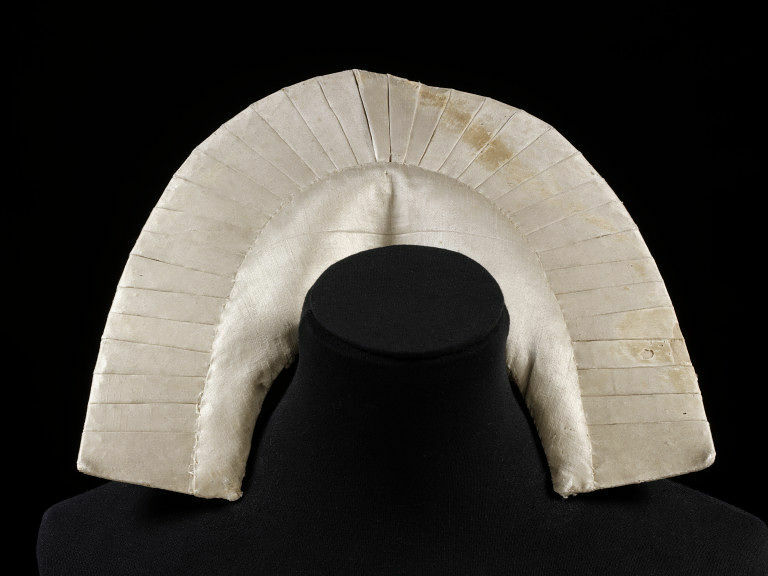 Although “piccadills” or “piccadilly collars” appear commonly in English sources, it seems that “rebato”, an Italian term, was most commonly used in England to refer to those collar supports that were made from wire. 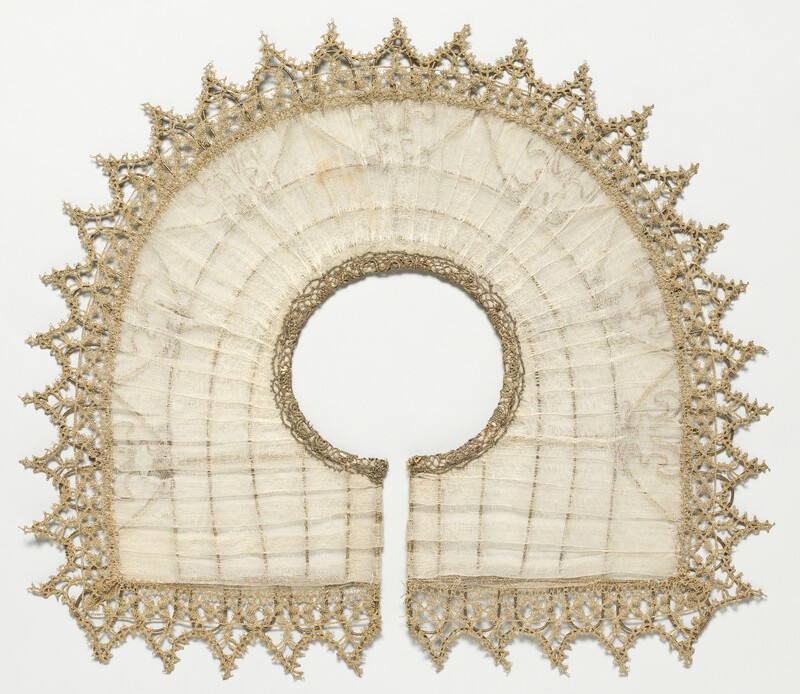 Unlike the structures made from board and silk, the rebato, with its intricate wire motifs, loops and scallops was both a collar support and a decorative neck ornament. There are well preserved examples of these stiffened collar supports in many museums in Europe. For example, the Victoria and Albert Museum in London has three examples of piccadills and supportasses made from pasteboard or cardboard. Fig. 1 Picadil of silk satin, pasteboard and silk thread. English, c. 1600-1615, Victoria and Albert Museum, London. Fig. 2. Supportasse of linen, silk, whaleboe, card, wire and linen thread. English, c. 1595-1615, Victoria and Albert Museum, London. Fig. 3. Supportasse of cardboard, silk, linen, silk and linen thread. English, c. 1600-1625, Victoria and Albert Museum, London. Tutorials on how to recreate two of these collar supports, the piaccdill in figure 1 and the supportasse in figure 2, are featured in Seventeenth-Century Women’s Dress Patterns: Book Two for anyone who is interested in constructing these particular types of collar support. Fig. 4. Rebato of wire, metal-thread bobbin lace, cotton, French, c. early 17th-century, Metropolitan Museum of Art, New York. As no patterns for these wire frames exist (as far as I’m aware) my rebato is based on a pattern drafted by myself using the rebato from the Musée national de la Renaissance-Chateau d’Écouen in Paris (fig. 5) as inspiration. The linen standing collar was based primarily on a portrait of a young French woman by an Unknown painter (if you know who painted this and where it currently held please let me know!). 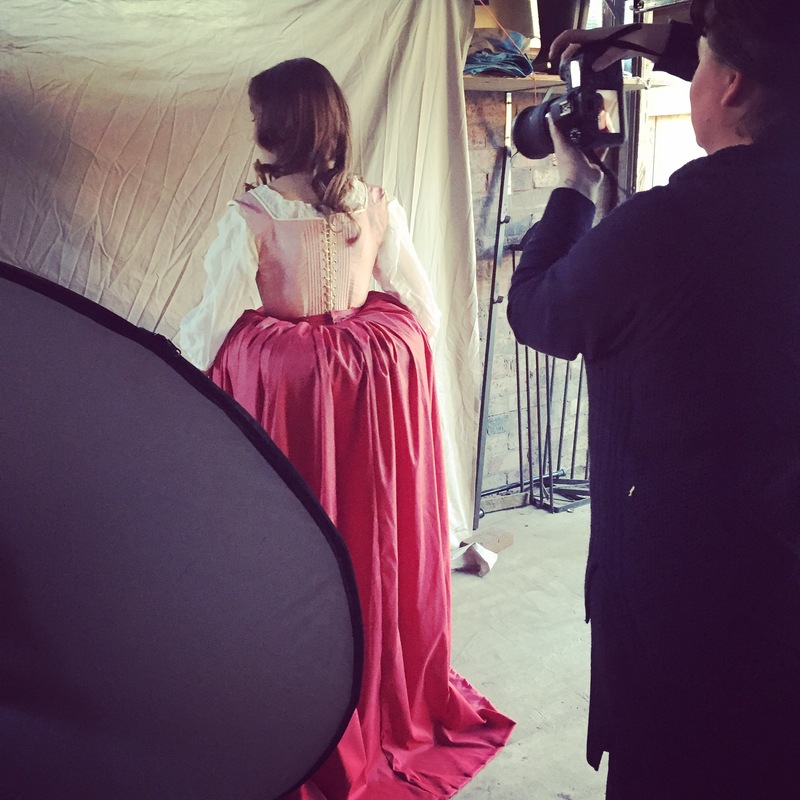 I also used the standing collar pattern in The Tudor Tailor as a guide and took much inspiration from the rebato made by the Couture Courtesan on her blog. Rebatos in museum collections are made from varying types of metal wire, including iron wrapped in silver gilt or gilded copper wire. So, for the outer frame of my rebato I decided to use a relatively thick galvanised tie wire that I picked up from my local hardware store. This was to make sure that the rebato would be sturdy and keep its shape. For the intricate loops and inner frame I chose to use two sizes of copper jewellery wire, as this was easy to bend and mould into any desired shape. 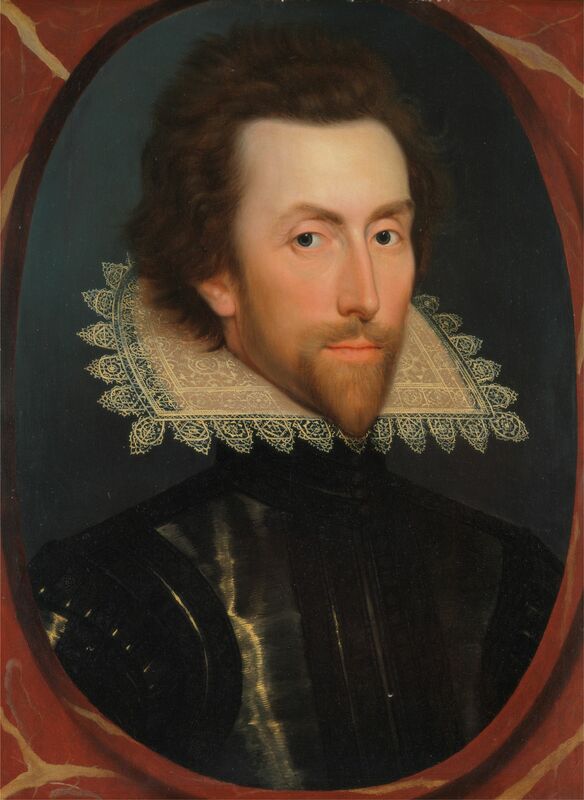 Ruffs, standing collars, and later, falling bands, were usually made from fine linen or silk. So for the collar I chose to use a lightweight linen fabric. As I was making this for an event I didn’t have enough time to buy period accurate lace from the somewhere like the Tudor Tailor Shop. Instead I found some period-looking 3cm wide guipure lace, which is a type of bobbin lace and was known as Genoese lace in the sixteenth and seventeenth centuries, and used this instead. Additional tools needed were: pliers and a wire-cutter, as well as thread (I used a cotton thread; silk or linen would be more period accurate). As I was pushed for time I also cheated a little on the linen collar and machined sewed parts where a straight running or back stitch would have been used. Make sure to stay tuned for my next blog post as I’ll be outlining how I constructed the metal rebato frame. Susan North and Jenny Tiramani, eds., Seventeenth-Century Women’s Dress Patterns: Book Two (London, V&A Publishing, 2012), p. 100. Denis Bruna, ed., La Mécanique des Dessous: Une Histoire indiscrete de la Silhouette (Paris: Les Arts Décoratifs, 2013), pp. 75-78. The Museum of Arts and Applied Sciences (MAAS) in Sydney, formerly the Powerhouse Museum, has an amazing collection of shoes that range from medieval work shoes to modern haute couture. The Joseph Box shoemaking archive forms the core of the collection, and when I was a curatorial volunteer in the design and textiles department I was able to view one of the more interesting pieces from this collection. Interestingly the design of these shoes leans to a production date in England in the early eighteenth century, around 1705-1715. Now, I’m sure any of my readers that are familiar with seventeenth and eighteenth-century fashions will note that the embroidery motifs on these shoes certainly do not resemble those of the eighteenth century. On close inspection you can see that the embroidery detail features strawberries, rosehips, carnations, thistles and cornflowers that are framed by metallic-thread scrolls. The presence of piecing in the fabric of the shoes indicates that they were most likely made from another older garment. 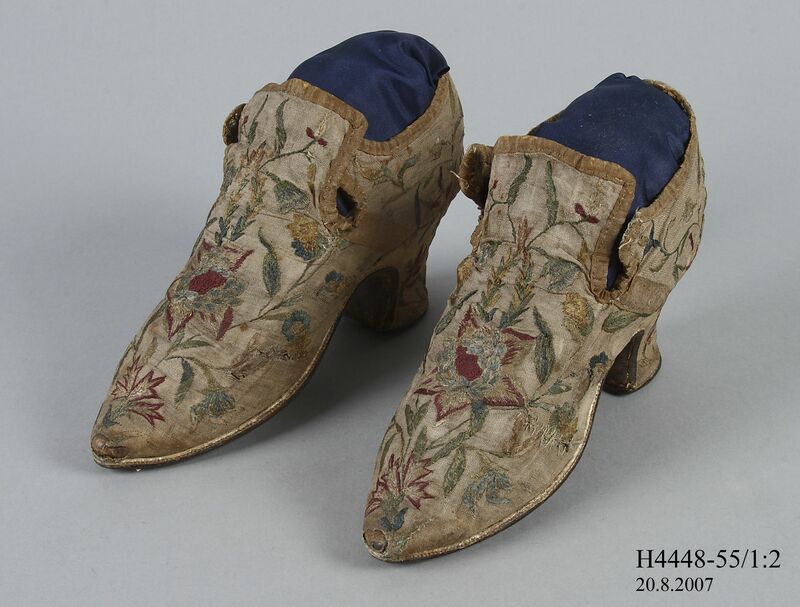 Going purely off the embroidery, it seems that these shoes have been made from an early seventeenth-century garment, possibly a coif, but it is more likely that they were made from an Elizabethan or Jacobean embroidered waistcoat, of which many examples have survived. Take for example the embroidered motifs on these linen waistcoats from the Victoria and Albert Museum. 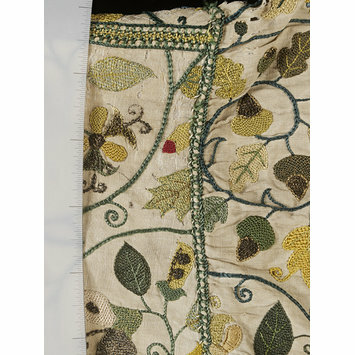 This woman’s waistcoat dates from 1600-1625 and features silk embroidery with spangles that depict “honeysuckle, pansies, carnations, foxgloves, borage, strawberries, cornflowers, rosehips, thistles, columbine and vine leaves.” Silver-gilt thread scrolls frame these floral motifs which was characteristic of this style of Jacobean design. As with the previous waistcoat and with most embroidered garments from this period, the floral motifs are framed by embroidered scroll work. How an intricate embroidered waistcoat came to made into a pair of shoes in the early eighteenth century remains a mystery. However, as all dress historians of the early modern period will attest, there are few surviving extant clothing examples, not only due to the age and fragility of these items, but also because many were often remade into other items. Fabric, particularly silk embroidery, was extremely expensive during the seventeenth and eighteenth centuries and so early modern people were the thriftiest up-cyclers. 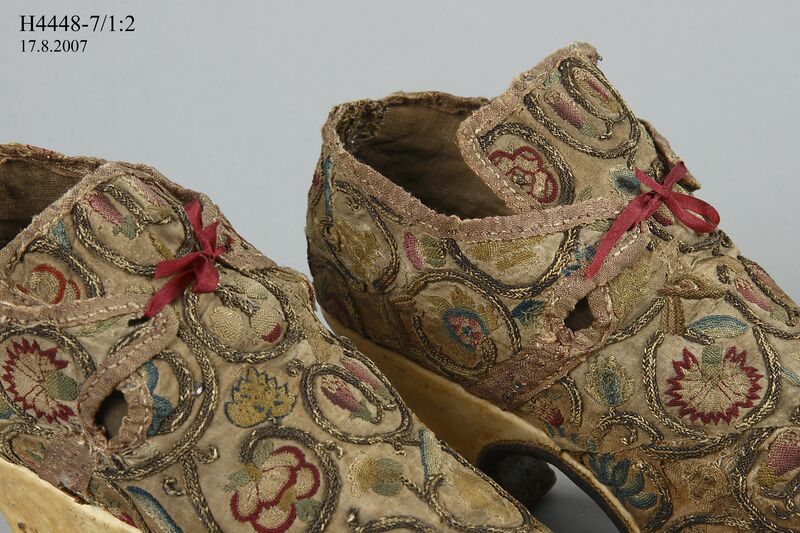 Embroidered shoes were also highly fashionable at the start of the eighteenth century, as this other pair of shoes in the Box collection shows. 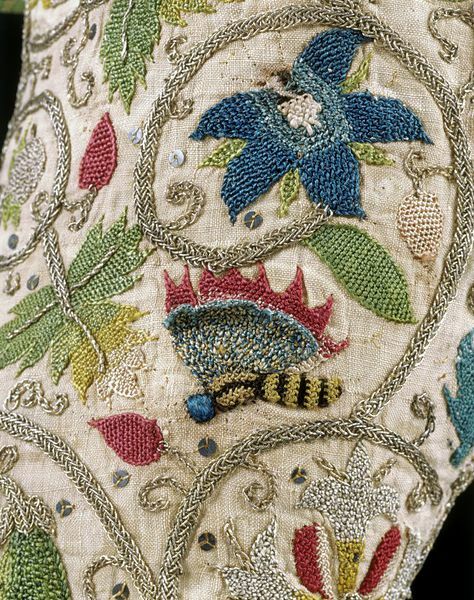 However, as you can see from this example, the style of embroidery, while still focused on floral designs, is much different to that other the early seventeenth century. Instead of paying for a brand new pair of shoes then, clearly for the original owner of these thought it was cheaper to remake a family heirloom into some fashionable eighteenth-century footwear. After many months of hand sewing and many pricked fingertips I present my reconstruction of the Filmer Bodies c. 1630-50 from Manchester Galleries. As I was working completely from pictures, a few measurements and curatorial notes when reconstructing these bodies it was only after completing them that I realised that there were a couple of things I got wrong. The first is that I did not do the boning channels 100% accurately. Although my boning channels run vertically to the centre front of the bodies, after reanalysing pictures of the bodies I can see that the boning is slightly slanted away from the centre-front at the top, like the effigy bodies. This would have been to allow for the bust and could slightly change the way that my reconstruction fits around the bust area, making it less accommodating of larger busts. Note to self: Make sure you analyse all your photos in detail before sewing boning channels! Secondly, I also realise that I did not cut the slits between the back tabs high enough. In my original pattern I actually had them much higher, as they should be, however, I wasn’t sure if it was going to be too high so I lowered the slits a bit. Turns out I had it right to begin with! Again this means that the fit of the bodies might be slightly altered, as it makes the waistline lower. One thing I cannot work out are the shoulder straps. These straps are designed to sit off the shoulder in accordance with mid-seventeenth century fashions. However, the straps on my reconstruciton are very short, even though I checked my measurements and calculations multiple times before I cut out my fabric. Either the original owner had very narrow shoulders or there is meant to be a length of ribbon holding them together. Then again, my blow up mannequin off eBay doesn’t have the best proportions so once I try these on a model hopefully I can work this out more. Overall though I’m extremely happy with how the bodies turned out and I can’t wait for my models to try them on!